You may be panicking that it's already the first week of November and you haven't yet started your Christmas shopping. 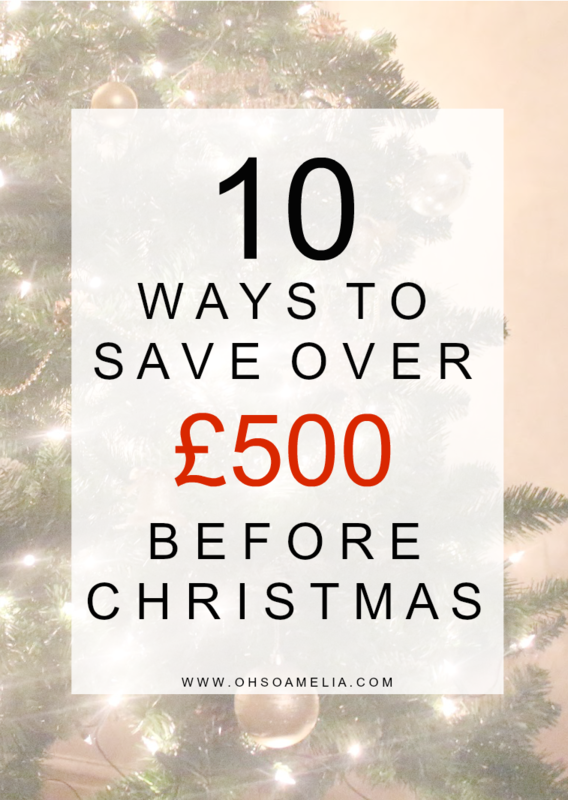 Well the good news is that there is still time to save especially if your bank balance is look rather depressing, here are 10 ways that you can save some extra money before Christmas this year. This is such an easy way to earn some extra cash, do you have any old mobiles lying around in drawers at home? I've been looking to sell my iPhone for a while now since my last upgrade and keep forgetting to do so. But just by selling my iPhone I can make £158.30! So easy and just think how many presents you can buy with that! Instead of grabbing lunch on your way to work each morning or nipping out to a local sandwich shop or even worse driving by the drive-though at Macdonalds take your own lunch in! This could save you at least £20 a week as on average people spend £5-7 on lunch each day which includes a sandwich, crisps, some sort of fruit or chocolate and a drink however it would cost your less than half of that if you took your own in. With around 30 more work days until Christmas this year if your took your own lunch to work every day you could save a whooping £200. Before buying any presents I've been using sites such as www.vouchacodes.co.uk to find the latest deals before making any purchases. Not only is this great in the lead up to Christmas but it's also a great website to use all year round as you can get money off 1000's of retailers such as The Disney Store, Argos, Sky and Toys R Us. which will save you lots of money in the long run. At least half of the nation eat pizza the next day, apparently it tastes better? Anyways the point I'm getting at is to re-heat your left over the next day. I know this can't be done with every meal but curry, casseroles and pizza are great for this! The idea is to cook once and eat twice, this will not only save you time in the kitchen but also save you some money too. By making enough to last over two days you could save around £10 a week as a meal for a family of four will cost on average around £5. Instead of having a take-out that could also save you £15-30 a week depending on what you order. A great way to save some extra money before Christmas is to stop going to the coffee shop every morning before work or on your lunch break! This is unnecessary spending when you could make your own at home and even put it in a travel mug. A latte costs around £2.80 which could save you £14 a week or £85 by Christmas. Take a look through your belongings, are there any items which you haven't used in a year, worn in the last 6 months or not sure why you even bought them? Well my friend, it's time to get rid of them! There are various places to sell your unwanted used and unused items such as eBay, Craigslists, Gumtree or even your local Facebook selling group. The average household has between £500-£1000 of unwanted goods collecting dust in their homes, many people just can't be bothered to gather them together and sell them. This may be tricky if you have a full house already or a large family but if you have a spare room in the house you can try renting it out. If you know some one who is looking for somewhere to live this could be a great way for you to get an extra couple of hundred pound a month. Now that football season is out of the way why not cut back on your premium channels and save £20 or more a month. You could even save double that if you cut back to a basic package and get rid of the kids channels, movies, HD and the sports channels! Use sites such as Supermarket.co.uk to compare the prices at the supermarkets in your local area. This could be for a specific item or your whole shop. You'll be surprised at how much you could save by shopping elsewhere. Most people nowadays have Instagram or Facebook. How about getting some money for your old clothes? Whether that be your own clothes or your kids. There's always somebody out there looking for a bargain on used or un-wanted clothes. Pop your clothes on sites such as Facebook selling groups or eBay where you can set up an online auction. I recently held an Instagram auction where I sold some of the kids clothes and shoes. I managed to make a whooping £370! A lot of the items were still in the wardrobe with tags on or had only been worn once and would have only ended up in the attic for god knows how many years or down the charity bank so I'm pleased I decided to sell them as I'd rather they went to people who could use them. Do you have any other tips for saving money before Christmas this year? * In collaboration with Voucha Codes. For details on how I work with brands take a look at my work with me page. Some fab tips there. I like the "cook once, eat twice" comment! People throw so much food away and I think that is a saying that will stick with me now! great tips Kerry - I need to sell some of our old stuff! enjoyed reading this post but your disclaimer really confused me. Is this a sponsored post, and if so should it not be labelled properly? bit misleading to your readers. Thanks Evie. Yes it is, thanks for letting me know had to remove some html earlier for the fonts so must have removed the disclaimer without realising have amended now. Great post and very timely as I'm sure everyone is now thinking towards Christmas. I can't believe that it's so close now. We've just moved house so selling my unwanted clothes has been a good way to bring in some extra cash. I like what I read here. Thanks!! These are fantastic hunny, I could have done with them last month so I could get Christmas shopping done. lol I wouldn't have thought to do some of these but they all add up.